Is this a cool little range gun? I will not be carrying it because whats 7rds gonna do? But does it cycle well, not very snapy, all the other good plinking values? BEST ANSWER: Something like 70+% of gun fights are over in 1-2 rounds. Why would you need seven rounds from a deep conceal weapon? That is called a reload. Ever notice LE has 2-3 reloads on their belt? What Mr. M said. Plus after a gunfight, no one has ever said "man I wish I had less ammo"
Only takes one well placed shot to end it! Is this the gen 1 or gen 2? does this have an rmr cut? What all comes with this pistol? Packaging? Plastic or cardboard box? The pistol comes in a cardboard box with 1 magazine, owners manual, trigger lock and a small soft sided pistol case. Great CCW. Great EDC. I was pleasantly surprised that it has functioned 100%. This is the second gen Diamondback pistol and it has been flawless so far. Once I manage shooting 200 or so rounds through it I will be carrying every day. Super small and lightweight and packing 9mm punch. Only took mine to the range one time and fired about 25 rounds through it. Fed, fired and ejected fine. Now I only shoot Hornady 115-grain critical defense rounds though it. People buy these little pistols and then try to shoot cheap-assed steel-cased ammo or +P loads and have problems. Shoot standard pressure high-quality 115 grain loads and you should be fine. Also, these have a good bit of snap when you shoot them. NOT the kind of pistol you will enjoy shooting all afternoon at the range. Shoot it enough to get used to it and then shoot something else. There is no safety and that bothers me !! I like the weight and feel, not sure if it will be my primary carry firearm. Time will tell. Not a bad firearm for the price. I need to put several more rounds thru it to make a final decision on its dependability. All likes, zero dislikes. Perfect pocket carry 9mm. Broke it in with 200 rounds various 115 grain ammo, fmj & hp. No malfunctions at all. Even handles that dirty cheap Russian stuff. I really enjoy carrying this little guy around, so light and compact I rarely know I have it on. Definitely going to get another one! Fantastic gun for the money! It cycles perfectly and have had no problems so far. The only short coming is if you have big hands the grip will be too small. Could try an extended mag, I have not. As far as Conceal Carry it was a little on the heavy side but hid well. No safety so keep that in mind if you're one for keeping one in the chamber. I looked a long time for this! The trigger release gives you an instant fire. Mild recoil. Very impressive. 5 star rating! A great little power house at a great price. I purchased this gun over a year ago. Have carried it some and had it on the range a dozen times with no problems. I even ran it dirty a few times and had zero failures to feed. Can't say that about my Beretta nano. Several types of 115 grain ammo and some 124. Also ran CCI blazers no problem. I like this gun. It's small size makes it easy to carry. It's not much bigger than most 380s. It's fairly accurate for its type. Then there is the price - $200 for a USA made handgun. Yep, it's a keeper in my book. I’ve carried this gun every day for over two years. It’s ultra reliable. I’ve shot about 1K rounds of various manufacturers. My carry ammo is Fort Scott munitions, CNC’d sold copper projectile. The only malfunction has been self induced by limp wristing. My guess, most people with problems that’s what’s happening. Treat it right feed it good quality USA made ammo, don’t limp wrist it and enjoy. While I have several other options, I find myself carrying the DB9 most often. It fits in my front pants pocket well and it has proven itself dependable. Regardless of my purchases, I always go back to the DB9. It is the smallest, lightest, thinnest 9mm that I have found and more concealable than most .380s. I think it is the most underrated gun on the market. I have had one ever since they released it 4 years or so ago. I love everything about it then comes actually shooting it. I have had some realiability problems but have not yet gave up on it I want to love it. I would say mine has got around to being 95% reliable using certain ammunition I have found it to like. Hopefully I will eventually feel confident enough to trust it to my life. Everytime I feel it's there and ready to trust my life to it will do a random failure of some kind. I still carry it as a backup. I've been a 9mm subcompact guy for years first with a Keltec PF9 added a SCCY CPX2 and evolved more recently an LC9s due to the striker fired trigger. When I bought the Keltec is was the smallest and lightest 9mm on the market then Diamondback released the DB9 which wasn't a very reliable pistol in the early days. But that 11oz weight and even a smaller footprint than the PF9 kept me intrigued until I finally took the plunge and picked up a DB9 a couple months ago at the $200 price point. It functioned flawlessly right out of the box with 8 mags of cheap WWB and Fed Champion 115gr FMJ earning my confidence for carry. I like the LC9s don't get me wrong its my choice for IWB CCW but at 17+ ounces I don't like it for cargo pocket carry slapping against my leg. Meanwhile I hardly notice the 11oz DB9 in cargo shorts almost a perfect offset to cell phone in the opposite cargo pocket so 6 ounces makes a big difference and thus the DB9 is definitely my choice for summertime daily carry. Winter came along and I found it even fits in the back pocket of my Levis none of the others could do that so I find myself carrying the DB9 about 75% of the time. Bought this one basically due to price and size. Size of a hand and easy to conceal either inside or out of belt. Firing it - a bit more of a kick than a larger 9mm and found the small grip kind of an awkward feel when firing two hand grip but fine with single hand grip. Smooth trigger feeling. Fired 28 rounds through it with no issues and fairly comfortable after a few rounds getting use to size. Cleaning - easy to field strip other than the tiny switch to release barrel and housing. As a concealed weapon perfect for close range protection and easily hides under a belt and no silhouette at all. Definitely fit in a average to small purse or even a wallet type holster or jacket pocket. I have been following this little guy for a long time lots of bad reviews out there some from those who never owned one some from those who have had problems. This is not a range gun it is a specially designed carry firearm that only weighs 11oz there are no lighter options for a 9mm because at 11oz basic physics specifically the weight of the slide as it relates to recoil energy required to cycle the weapon. I finally took the plunge in October and got one because my EDC a Ruger LC9s at 17+oz was still too heavy to pocket carry comfortably in cargo shorts bouncing against my leg. First range trip with the DB9 was awesome with a mixture of WWB and Fed Champion 115gr FMJ and also cycled Federal Classic 115gr JHP fine. 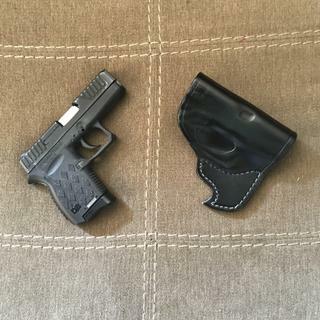 I can now carry the DB9 in the back pocket of my jeans where the Ruger or my old Keltec PF9 would stick out and in cargo shorts its not much different than my cell phone on the other side. Diamondback did have quality issues when this gun was first released but my direct experience is that the second generation DB9 is fine it has a lifetime mfg warranty and Kim at DB Customer Service is very responsive. Pay heed to the instructions no +p and nothing more than 124gr unless you want to invite problems. 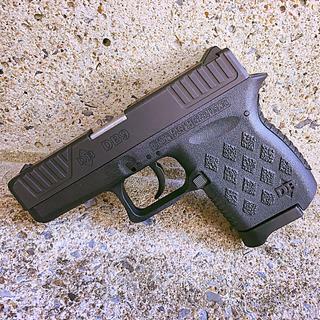 My previous EDC pistol was a LCP and I was happy with it but when the DB9 came out I was excited. 9mm size in a compact nano pistol pretty much the same size as the LCP and a local company out of Cocoa FL producing it? I had to have it. My excitement lasted until the first time to the range when the FTF's started. Followed by FTE's. Followed by not wanting to run ANY hollowpoint defensive rounds. Which is pretty much paramount in a EDC weapon at least for me. Took it to DB for them to look at. They replaced the follower saying that was the issue. Back to the range excited it would work. More problems. Never ran right and I relegated it to a trade-in on S&W Shield 9mm. Best decision I ever made. If I could give the DB9 0 stars for quality I would. I have owned 2 of these guns. Neither one would fire 2 shots without hanging up!! !